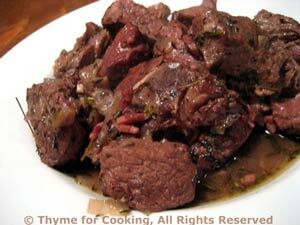 Thyme for Cooking Weekend Menu: Lamb Braised in Red Wine, easy recipes. Another braise - but 'tis the season, after all. The potatoes can be cooked through the first stage earlier as well. The lentils and chickpeas are for two meals. Substitute pork for the lamb if you prefer. Slow-cooking lamb in wine is typical all over France. This uses red wine, similar to the version made in Avignon. The original is slowly baked for 5 hours in a 350F (180C) oven; I opted for a slow braise on the cook top. After 2 hours the flavors have blended perfectly and the lamb melts in your mouth. Cut onion into quarters, then slice. Cut lamb into 1 1/2" (4cm) pieces and trim excess fat. Heat oil in a heavy pot or Dutch oven with tight-fitting lid. Add bacon and sauté until starting to get crisp. Add onion, shallots, garlic and sauté until tender. Add lamb and lightly brown. Add all remaining ingredients and bring to a boil. Cover, turn heat to low and braise for 90 minutes. Serve lamb with onions/shallots and pan juices. These are slightly different than my usual oven fries, but still crispy on the outside, creamy on the inside; finished with just a sprinkle of salt. Cut potatoes in half (the short way). Put into a saucepan, cover with water (add a pinch of salt) and bring to a boil over medium-high heat. Partially remove cover and continue to cook until barely done - about 15 minutes. Drain, cover with cold water and drain again. Let rest for 5 minutes, (or longer) then cut into slices 1/2" (1.25cm) thick - about 3 slices per half. Heat oil over medium-high heat in large, nonstick skillet. 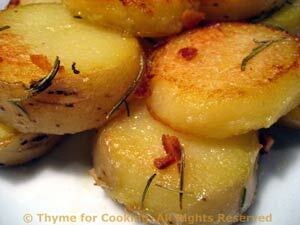 When hot add potato slices (placing each flat), rosemary and garlic - sprinkling over potatoes and into oil. Sauté until lightly browned, 6 - 8 minutes. 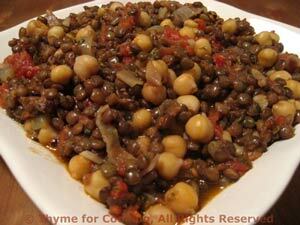 I use the tiny, green lentils de Puy, but the larger brown or tan lentils will work as well. This is a simple method and would work equally well with any legume - highlighting the flavor of the vegetable. Cook the lentils in water and stock, with the bay leaf, 20 - 30 minutes, according to package directions, or until done. When done, remove from heat and drain if needed. Remove the bay leaf. Finely chop shallots and mince garlic. Heat oil in medium skillet over medium heat. When hot add shallots and garlic, sauté until tender, about 8 minutes. Open and drain tomatoes, reserving juice for another use. Roughly chop tomatoes and add to shallots. Add lentils, chickpeas, cover and simmer 10 minutes. Serve.